Wines produced from the Muscat family of grapes have been prized for centuries for their vibrant fruit and floral aromas. This exceptional Muscat Ottonel is finished in the drier European style. Viticulture notes. Muscat Ottonel is the first grape we pick each harvest, usually in mid-September. Early picking allow us to highlight the grape’s natural lemony-citrus character. Winemaking notes. We lightly press our Muscat Ottonel grapes, and leave the juice in contact with the skins for several hours to maximize varietal character. Fermentation is performed in stainless steel tanks at cool temperature. The wine is then aged in stainless steel tanks and bottled very young to capture the wine’s aromatic qualities at their peak. Tasting notes. 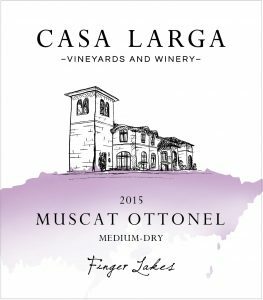 This exceptional, dry, European style Muscat Ottonel has a fragrant floral nose, vibrant citrus notes, and a luxurious finish. Pairing suggestions. Delicious as an apéritif, this wine is also a beautiful accompaniment to light salads and vegetable dishes.